Sometimes it takes the smallest nudge to push the creative buttons, and sometimes that nudge comes from the most interesting places. I've almost always looked at beef shortribs as a braised meat that was destined for the center of the plate. 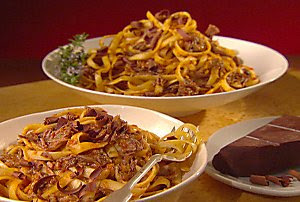 But of all places, while watching Giada De Laurentiis make short ribs with tagliatelle it dawned on me to use the shortrib, to manipulate it, to turn it into something new. It would be a mistakefor anyone to think I'm at home watching the Food Network for inspiration. We all understand why a grown man would spend time watching Everday Italian, and it isn't for a lesson on bruschetta. So far today I've made potato gnocchi stuffed with shortribs, and veal meatballs stuffed with shortribs. I'm thinking of making a fritter from the shredded meat might be a nice accompaniment for an onion soup. What about baking a piece of cooked shortrib in a terra cotta dish filled with cornbread batter? I can keep going, shortribs as stuffing, filling, ect. It all just seems very fresh, and tasty as I imagine it. How do you stuff meatballs with shortribs? That sounds interesting. The tagliatelle is really appealing. I could eat that right now and it's not even 8:30 a.m.
For the meatballs i take cold cooked shortrib meat and cut a small 1/2 in dice, then a make a meat ball the size that cube will fit in, then push the cube into the center of the ball and pinch the opeing closed, roll the ball around to tighten it up, and it's in there. You could bring some to your Momma home on Sunday. It all sounds mouth watering.